Stand-up Tim Vine co-starred in the BBC One sitcom No Going Out and both series of ITV1’s The Sketch Show is also a TV host, having devised and presented Fluke for Channel 4, which was nominated for a Rose d’Or Award. He was also the first man to appear on Channel Five when presenting quiz show Whittle. Tim has also starred in The Tim Vine Christmas Present for Five, Saturday Live (ITV) and The Stand Up Show (BBC1). Tim recently became the Guinness World Record Holder for telling the most jokes in an hour – smashing the previous record with a total of 499. 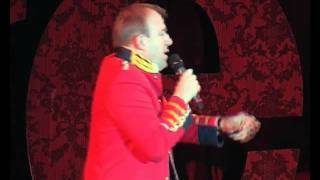 He has appeared on the Royal Variety Show alongside Shirley Bassey and Kylie Minogue, and hastoured the UK with his The Joke Machine Gun show. 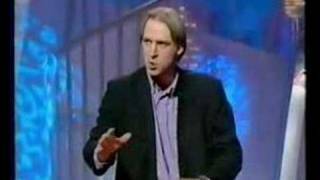 He burst onto the stand-up circuit by winning the Perrier Best Newcomer Award for The Tim Vine Fiasco at the Edinburgh Festival in 1995. That followed a runner-up prize in the Hackney Empire New Act Of The Year competition in 1993. Tim’s solo shows in Edinburgh include Tim Vine Flat Out (1998) and I’m Vine Thanks and Tim Vine and the Minotaur (both 1999). 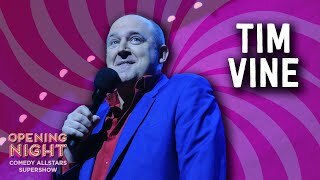 We do not currently hold contact details for Tim Vine's agent. If you are a comic or agent wanting your details to appear on Chortle, click here.